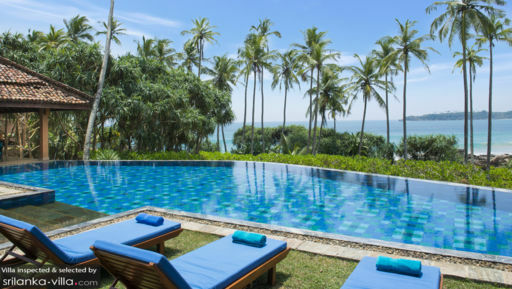 Lansiya is a charming property in Sri Lanka with direct access to Seenimodara beach that allows a dazzling display of azure blue waters, distant islands, and clear skies while the sun’s out. While the coastline is fringed with towering palm trees, the villa gardens are flush with natural abundance with manicured and expansive lawns, dense tropical foliage, and varying types of blooming flowers. The villa architecture speaks of bygone days with quiet antiquity and understated elegance with rustic living at its centre. 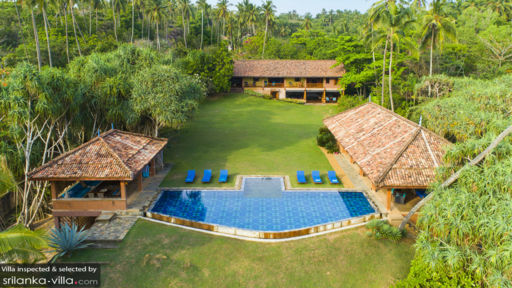 Along with tradition, this gorgeous Sri Lankan home also offers you a plethora of activities, amenities, and modern comforts making this the perfect home away from home! Lansiya is home to four bedrooms, each perfect and luxurious in its own way with three bedrooms located in the main building, and the fourth housed in an ocean-front pavilion. The first three bedrooms are furnished with four-poster king-sized beds, while the fourth has a king-double, all of them equally comfortable. The bedrooms share the rustic decor of the rest of the villa with bright pops of old-timey blues, traditional thatched-ceilings, and wooden interiors. There are private balconies offering an ocean and/or garden view for the best experience! Each bedroom enjoys its personal en-suite bathroom. As if an arrow pointing you to the spectacular ocean waters, the private infinity swimming pool at Lansiya is just what you need to refresh your mind, body, and soul. Enjoy the cool, crisp waters at your own pace while floating under the skies, and breathing in ample amount of fresh, island air. The beautiful landscape is hard to miss and you can make the most of it while relaxing on the nearby sun chairs. 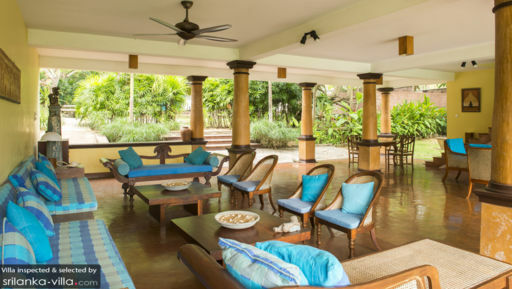 While the kids run around the gardens, the adults can rest in the traditional gazebo which houses a luxurious, aquamarine-tinted living area with chairs, sofas, and coffee tables! Since the view is an enviable one, the open-concept living area is located directly facing the ocean and gardens, so you have it in your line of vision throughout the day because you don’t want to miss the stunning sunset! The living area has been furnished with comfortable and plush sofas and a variety of chairs for added luxury as well as ease for everyone. The rustic walls and hand-painted blue window frames add a quaint and charming quality to its interiors that work together with the luscious greenery surrounding it. In an ocean-facing dining pavilion, which is as close to the waters as it gets, there is an American-style bar complete with bar stools where guests can grab a drink or two! This dining pavilion houses a 12-seater dining table as well for exciting meals with loved ones. You can choose to dine wherever you please: beside the pool, out near the ocean, indoors, etc. The air-conditioned TV Room is equipped with modern amenities like a vast DVD collection, books and games, as well as its own en-suite bathroom! The villa is looked after by a team of dedicated individuals whose work is in turn overseen by a villa manager. They will help clean and keep the villa as fresh as the day you arrived. An excellent chef is available on property and meals are charged extra per individual. When you have the beach right at your doorstep, you don’t have to travel far to have a good time. Simply take long walks along Seenimodara beach, or if you wish you can even head to nearby Mahawella beach. Tangalla is closeby with its world of breathtaking beaches and you are definitely spoilt for choice in finding the best one! Take a day trip out to visit one of the National Parks or just relax in your private villa and enjoy the serenity and calm surroundings.